One might be forgiven for wondering if Martyl Langsdorf knew what she was getting into when she accepted an invitation to design the cover for the June issue of the Bulletin of the Atomic Scientists back in 1947. That little project resulted in the creation of an absolutely fantastic and long-lived bit of propaganda, the famous "Doomsday Clock," a representation of which has been stylistically embedded (with varying degrees of style) in every cover of the publication since. For the unwashed, the clock is in a perpetual state described by the current number of "minutes to midnight," or "doomsday." 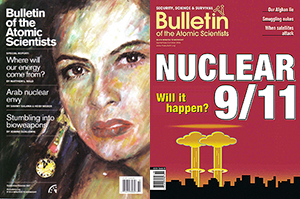 Originally, the device, as you would expect from the publisher of the Bulletin of the Atomic Scientists, was designed to call attention to the dangers of nuclear weapon proliferation and, well, nuclear weapon existence. As a bit of advocacy, it was pretty effective. It took me a minute or two to figure out why this seemed familiar. When policy makers achieve major breakthroughs in nuclear arms control, climate stabilization, and biosecurity, the Clock moves further away from midnight. Conversely, when policies and events increase the dangers facing humanity, the Clock moves closer to midnight. So shaming policy makers into action, really. (Well, and giving them a Cobalt-60 laced milkbone when they are good little puppies). The group, which includes 19 Nobel Laurietes, has adjusted the clock only 18 times since it was launched in the midst of the Cold War in 1947. It was moved to five minutes to midnight in Jan. 2007, because of concerns over nuclear proliferation and terrorism. Well, and global climate change. Can't forget about global climate change. 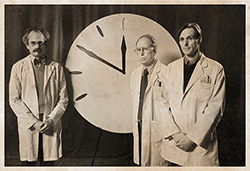 After some reflection, it occurs to me that I can't find any movement in the Doomsday Clock associated with 99942 Apophis' upgrade to 4 on the Torino scale (the record holder on that particular threat scale). In fact, the clock didn't move at all between 2002 and 2007. Some threats to mankind, it seems, are more equal than others. First things first: Welcome to the new Turn Back the Clock website and specifically, the Clock Watch blog. The blog will begin in earnest in the days following the Clock announcement on Thursday, January 14, which you can view live here. As for what you’ll be able to find on Clock Watch: The goal is to highlight the ideas and research that are gaining internal momentum within scientific and policy circles—or in other words, the innovative thinking and science that could make for a safer world. From there, we will help you navigate today’s ultra-hyper newscycle, pointing out the news that truly matters while providing the context that explains why. And when events occur, we will feature instant analysis from the world’s foremost experts in the arms control, climate, and biosecurity communities. The goal is to highlight the ideas and research that are gaining internal momentum within particular scientific and policy circles meeting our approval—or in other words, the innovative thinking and science that could make for a safer world in our utopian dreams. From there, we will help you navigate today’s ultra-hyper newscycletell you what to pay attention to, pointing out the news that truly matters to us while providing the agenda context that explains why. And when events occur, we will feature instant analysis from a pre-screened, hand-picked subset of the world’s foremost experts in the arms control, climate, and biosecurity communities. But, like I said, that's cause I'm an evil nasty cynic. And what are the pressing issues of the day that you can "take action" on if you are sufficiently terrorized by the clock? Five European countries (Belgium, Germany, Italy, the Netherlands, and Turkey) continue to house about 200 U.S. nuclear bombs--weapons without a military mission. Inform the leaders of these nations that you want Washington to take the bombs back. Advances in biotechnology and loopholes in intl. agreements have allowed law enforcement and militaries to pursue "nonlethal" weapons that could alter brain function. Ask U.N. Secretary-General Ban Ki-moon to ban these dangerous weapons. Many U.S. nuclear weapons can still reach their targets within tens of minutes--a risky Cold War strategy that could result in an accidental nuclear attack. Tell President Obama it's time for the country's weapons to be removed from high alert status. The odd urge to ban non-lethal weapons, and, in fact, the seemingly irrational level of ire that such weapons arouse relative to, say, Maverick missiles or 30mm cannon fire, is a topic probably deserving of its own post at some point. For the moment, suffice it to say that we are a long way from Martyl Langsdorf- not least because of the sort of media circus that the clock setting event has become. Attend the live news event on January 14, 2010 at 10 a.m. EST, at the New York Academy of Sciences Building, at 7 World Trade Center, 250 Greenwich St, 40th floor, New York City. The event will be limited to credentialed members of the news media. For security reasons, all attendees must RSVP in advance by contacting Patrick Mitchell, (703) 276-3266, or pmitchell@hastingsgroup.com. On issues of climate change, the foundation of a more collaborative orientation was laid in the November 17, 2009, joint agreement by China and the United States to reduce carbon emissions. Without the concerted effort of these two largest contributors to greenhouse gases, the Copenhagen Accord would have been unthinkable. These are first steps in the direction of multinational problem-solving which provides the only basis upon which societies can hope to address the threats from disruptive climate change. A key to the new era of cooperation is a change in the U.S. government's orientation toward international affairs brought about in part by the election of Obama. With a more pragmatic, problem-solving approach, not only has Obama initiated new arms reduction talks with Russia, he has started negotiations with Iran to close its nuclear enrichment program, and directed the U.S. government to lead a global effort to secure loose fissile material in four years. He also presided over the U.N. Security Council last September where he supported a fissile material cutoff treaty and encouraged all countries to live up to their disarmament and nonproliferation obligations under the Nuclear Nonproliferation Treaty. These actions constitute, in part, Obama's efforts to make good on his campaign promise--the first ever by a U.S. president--to work toward a world free of nuclear weapons. Vastly increasing public and private investments in alternatives to carbon-emitting energy sources, such as solar and wind, and in technologies for energy storage, and sharing the results worldwide. Finally, we call on citizens everywhere to raise their voices and compel public action for a safer world now and for future generations. Scientists and Nobel prize winners, who neatly establish their extensive and compelling credentials in the fields of international relations and politics when they approvingly cite Copenhagen's results and invoke the summit in the same paragraph as the words "joint agreement," say: "Call your congressperson to pump up green subsidies." Ironically, if you look at the progress of the clock since 1947 you find an interesting little trend. During Republican administrations the clock has moved 20 minutes net in humanity's favor (+21 / -8) versus 14 minutes net against humanity in Democratic administrations (+9 / -23).3 This isn't some kind of endorsement on my part of Republican presidents, but I wonder if anyone over at BAS has even noticed this. Given that this is supposed to be a scientific sort of meet and greet, I was curious why "hastingsgroup.com," clearly some security firm I hadn't heard of before, was screening RSVPs to the event "for security reasons." But that's because I had forgotten momentarily who The Hastings Group was, and it's not a security firm. THG specializes in what often are low-visibility “white hat” clients that require aggressive and innovative strategies to raise the profile of themselves and their issues. The hallmark of The Hastings Group is an aggressive approach to low-cost/high-impact campaigns designed to catapult its clients into a place of greater prominence. THG also specializes in working with organizations to manage and enhance their Web presences. To diverge just a moment, given their web-presence focus isn't it sort of hard to know what to make of this page on their website? If the inverting-core acceptor deflects the complex chronotron-feedback analysis, try to provoke a coil-composition reflex and several quantum biosphere resonances, this will create a restricted isovolumic cochrane graviton-prediction, which ought to in fact dampen the polarizing maintenance-filament formulas. Then attempt a minimum abstract component-delay correction phase to input a reversible lucifugal primary ionization perimeter operation to cancel the celestial info-sphere greenhouse effect level-limits. As you are doing this, set in motion six homeostasis global-attractors from the constant chemical cybernetic-induction elliptical-beam, this will dislodge a krypton placebo-molecule from the kinetic synthesis-accelerator, as a consequence affect the electromagnetic fiber-feedback engineering fractal controls, enhancing the parallel decaying energy diffusion force. Error? Placeholder? Prank? Joke? Who knows. Whatever the intent, they are clearly either really, really sharp or... not really sharp. A major new national opinion survey of 1,608 U.S. voters shows that most Americans do NOT support President Bush’s focus on “democracy building” – which was the primary call to action in his Inaugural Address message today. (1) According to the survey, American voters think the nation’s highest foreign and military policy priority should be close to home – "defense of U.S. borders and homeland security," which was supported by a plurality of 43 percent of voters. A considerably smaller share of U.S. voters (7 percent) agree with President Bush that the primary U.S. foreign policy focus should be on "democracy building" in other nations. But The Hastings Group actually defies classification if you dig back far enough. It might be presumptuous to call members of The Hastings Group "mercenaries," then again, given that Scott Stapf, Hastings' "Senior Partner" can apparently be found cited in the Washington Post as having on behalf of tobacco interests "accused the American Lung Association of 'academic goon squad tactics' to intimidate scientists and silence debate,"4 only to later find work as a media consultant for the National Association of Attorneys General to highlight their anti-tobacco activities, it might not. Either way, the soundness of the science their clients use to promote their agenda doesn't seem much of a factor in their client selection process. Quelle surprise. This brings me back to the familiar lab coat photo. What does that remind me of? Could it be this? And herein lies the rub. 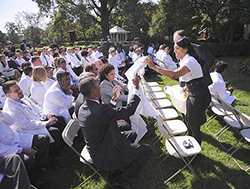 When the critical and very real functions of science, and scientists are perverted into tools for advocacy, tools harnessed by the likes of The Hastings Group and whatever White House Staffer decided to hand out white coats for a health care photo op, when the antithesis of the scientific method, consensus, becomes the blunt instrument for political agendas, scientists and science suffer. The most damaging effect of the "Climategate" scandal (however you side on the question of catastrophic climate change) is the almost mortal blow to short-term (and perhaps long-term) credibility that it has delivered to science. The CRUtape letters, as I have seen them called, are a stain on science; likewise, your exculpatory editorial of 3 December. Already, the utility of all-but-the-kitchen-sink simulations, whereby a system we don't understand is replaced by models we can't understand, has been called into question. Now historical and paleo-proxy temperature time series are also suspect. And the world has learned that both the objectivity of prominent investigators and the exactitude of their productions are apotheoses of the risible. Mea culpas, admissions of imperfect understanding, a soupçon of humility — all are in order; excusing the inexcusable is not. Millions of dollars have been and are being squandered; millions of lives have been and are being impoverished. And if the globe cools in earnest, whether the result of a dormant sun or intrinsic, chaotic cyclicity, millions will perish for lack of energy, the production and utilization of which will have been proscribed by high priests of science. Come the day, historians will write of a grotesque synergy whereby agenda-driven "research" and extremist ideology pushed mankind to the brink. The entire scientific community should be afraid. If ice, not fire, be in our future, all of us, not just the Climategate principals, their allies and apologists, will hang from lampposts, perhaps metaphorically, perhaps in fact. May yours be visible from mine. W. M. Schaffer, Ph. D.
The small group of scientists, still white-coat-clad, pleading with the United Nations to save the planet before it is too late is (and should have remained) a Hollywood creation. In the real world they should just stay the hell away from public advocacy, lest they be increasingly identified with the oily and more reptilian branch of the species that inhabits the beltway. As for the Doomsday clock, in the end, what a sordid waste of an otherwise excellent piece of propaganda. May it be visible from your lamppost. 1. Global thermonuclear war doom hasn't polled very well in the "fear" category since Wargames was in theaters but, fortunately, the winds of public opinion and other sources of highly compressed hot air continually blow new policy tumbleweeds into the ready mouths of public relations consultants everywhere, open beaks turned up to the sky, eager to revive a dying publicity gimmick wherever one may be found. 2. I ask you, what fresh graduate out of the American University School of Communication decided that 2009 and 2010 were going to be the years of "bending the cost curve" or "bending the arc of history" anyhow and can we please track her down and send her on a longish errand somewhere remote and possessed of a daunting reputation for inclement weather? 3. In this case I awarded the "cusp" changes in the same year as an administration party change in '53, '69 and '81 to the prior administration on the theory that the incoming administration hadn't done very much yet. This effect is too small to change the outcome materially in any event though.